We've long predicted that the US-backed Syrian Kurdish forces currently holding a vast chunk of land in Syria's northeast with the help of American coalition air power will naturally drift toward striking a deal with Assad, as the two sides have throughout the war exercised some degree of quiet cooperation against ISIS, foreign jihadists, and Turkish expansionism. In a huge weekend development which has gone largely unnoticed by mainstream media, the political wing of the US-trained and supported Syrian Democratic Forces (SDF) announced it is open to entering into unprecedented direct negotiations with the Assad government over the future of the country. The Syrian Democratic Council, or SDC, is the political arm of the powerful alliance of mostly Kurdish and Arab fighters that make up the SDF, and on Sunday declared willingness to enter into "unconditional talks" with the Syrian government. In a statement on Sunday, the SDC said it was committed to resolving Syria's deadly conflict through dialogue, and would not "hesitate to agree to unconditional talks". "It is positive to see comments about a summit for Syrians, to pave the way to start a new page," it said. Leading SDC member Hekmat Habib told AFP that both the council and the SDF "are serious about opening the door to dialogue" with the regime. "With the SDF's control of 30 percent of Syria, and the regime's control of swathes of the country, these are the only two forces who can sit at the negotiating table and formulate a solution to the Syrian crisis," he said. As Syria analyst Joshua Landis confirms, the surprise SDC announcement comes just days after a controversial deal reached between Turkey and the US for the withdrawal of Syrian Kurdish forces from Manbij. Syrian Kurdish leaders were enraged by the agreement, announced over the weekend, which allows for US and Turkish forces to patrol the northern Syrian city — though the Syrian Kurdish SDF wrested the city from ISIS in a major 2016 offensive. Turkey has consistently demanded Kurdish withdrawal from Manbij after President Recep Tayyip Erdogan invaded northern Syria in his non-ironically named 'Operation Olive Branch' early this year, aimed primarily at annexing Afrin canton. 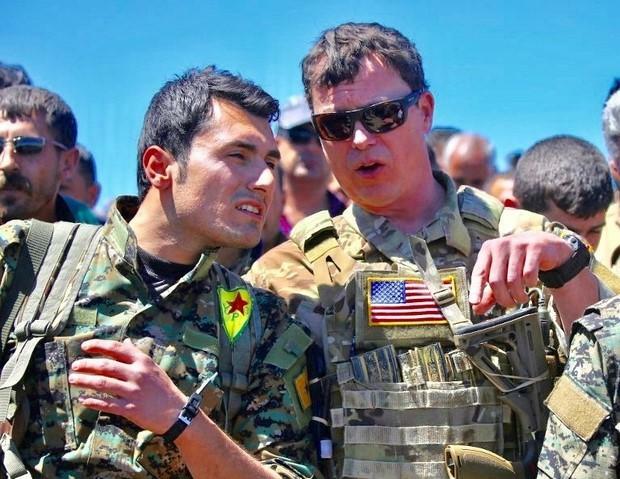 Increasingly, America's incoherent policy regarding the Kurds and Syria more broadly has put the more than 2000 US troops occupying northeast Kurdish heavy regions of the country in the middle of a Kurdish-Turkey-Damascus final showdown for the future of Syria. As we remarked after Mattis' weekend comments stating his desire to keep troops in Syria, Syria looks to be going the way of other major US wars: an open-ended situation short of success in which officials simultaneously are unable to come up with a plan to “win,” but will resist any pullout so they never completely lose. Both the Syrian government and Syrian Kurdish forces understand this well, and know that Syrians alone are the lasting stakeholders in the country — something increasingly obvious as the US appears to be handing over sovereign Syrian territory over to expansionist NATO ally Turkey. A Syrian Kurdish SDC official further stated of weekend developments, "We are looking forward, in the next phase, to the departure of all military forces from Syria and the return to Syrian-Syrian dialogue" — in a reference to both Turkish and US occupying forces. Though the US endgame continues to be the ultimate million dollar question in all of this, it appears at least for now that this endgame has something to do with the Pentagon forcing itself into a place of affecting the Syrian war's outcome and final apportionment of power: the best case scenario for American power in the region being permanent US bases under a Syrian Kurdish federated zone with favored access to Syrian oil doled out by Kurdish partners, and we could now be witnessing the early phases of such negotiations. But if indeed the Kurds are cutting separate deals with Russia, a US exit from Syria could be forced sooner rather than later. Notably, in a wide-ranging interview with RT News last month, President Assad issued an ultimatum to Syrian Kurdish militias backed by the US: "We're going to deal with it by two options: the first one we started now opening doors for negotiations, because the majority of them [SDF] are Syrians. Supposedly they like their country, they don't like to be puppets to any foreigners," Assad said. "If not, we're going to resort ... to liberating those areas by force. It's our land, it's our right, and it's our duty to liberate it, and the Americans should leave. Somehow they're going to leave," Assad added while speaking to RT. While it appears the Pentagon is now (predictably) selling out the Kurds to Turkey, Assad has consistently taken a pragmatic approach in dealing with the US-backed SDF, reminding them that no foreign supporters could possibly have Syrian best interests in mind: "either you have a country or you don’t have a country" he said in the RT interview of the foreign invasion of Syrian soil over the past years of war.